I've put a fixed version up on the web at http://www.reenigne.org/2p2048 . Now it properly detects when the keyboard player has lost! This is genius. 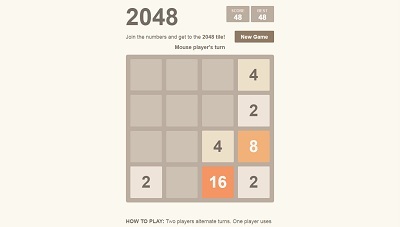 It's 2048, but two player. One plays as normal, the other chooses what tile comes next and where. Simple, but it totally changes the game. It becomes incredibly strategic, more like chess than regular 2048.
now I understand what's going on, this is cooool!